Getting free stuff is fun. Signing up for a loyalty program to get free stuff is less fun. Signing up for a loyalty program to get free stuff that you don't want because it literally almost killed you? That, my friends, is no fun at all. In a moment of majestically tone-deaf customer service, Gothamist reports, the budget-travel company (which is owned by Greyhound) told one rider/survivor of the now-blown-up bus that she could have "a couple round trips," after she signed up for BoltRewards, their loyalty program. That didn't come from some phone-center lackey, either -- that's straight from BoltBus' director of operations. 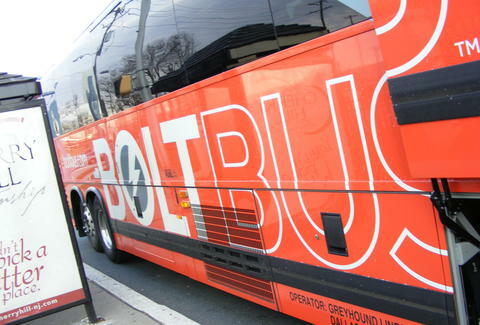 Keep in mind that this is the bus company who advertises promotional sale fares with its clever slogan slogan, "Bolt for a Buck." Two round trips, at a buck each way, would total out to a value of literally $4. Plus fees -- but who knows, maybe they waive fees for BoltRewards members! Sorry about that time we almost turned you into a charred pile of human flesh and despair! If you'll just give us your personal info that we can use for marketing purposes, I'd be happy to give you utterly valueless and potentially deadly future rides! In all seriousness, this explosion was pretty damn terrifying, and it probably would have remained in the news cycle much longer had not Amtrak 188 fatally derailed in Philadelphia just a few days later. The moral of this story? There is no moral. Everything is scary. Stay inside, stay alive. And sign up for those loyalty programs! They could save your life, and save you, like, almost five bucks. Dave Infante is a senior writer for Thrillist. Follow @dinfontay on Twitter, Instagram, and Snapchat.